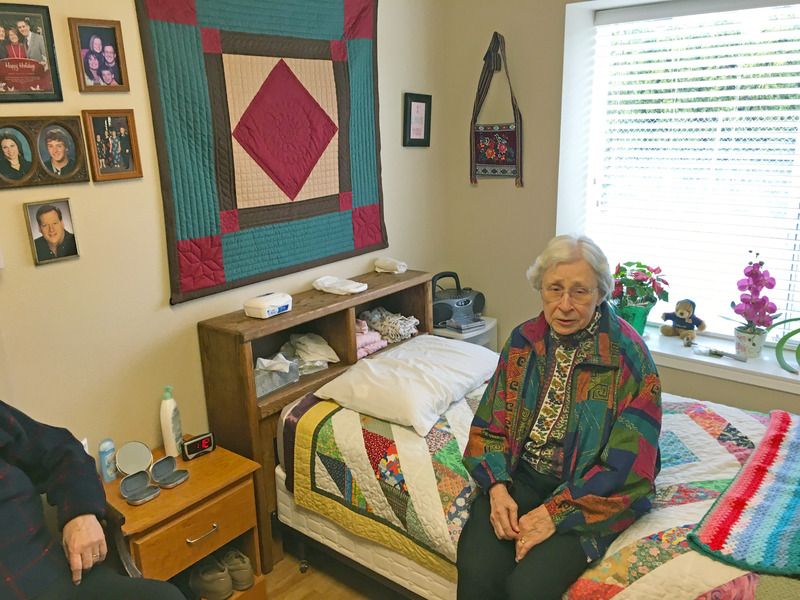 On 4/28/2016 Brian, Katherine and Howard helped move Virginia Wilson's (83 years old at the time) from "The Caring Place" to "Conifer House". 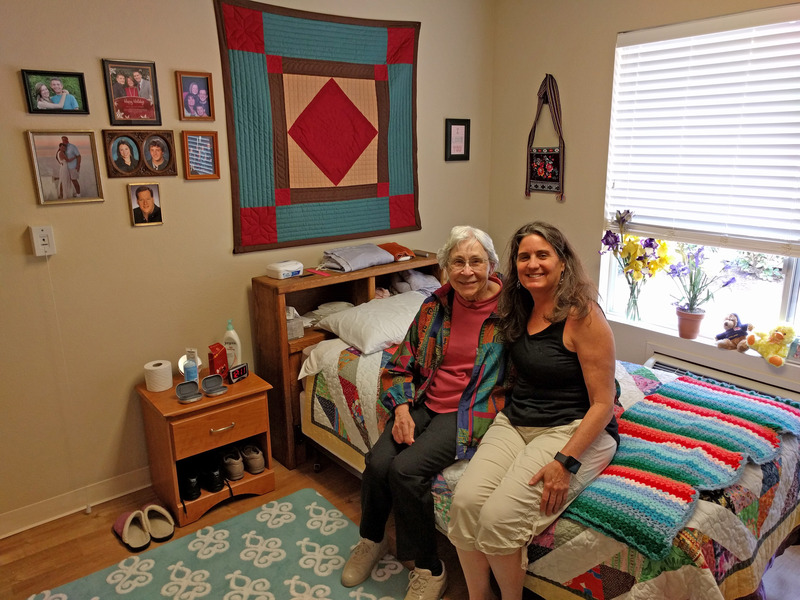 Katherine and I flew up to Corvallis, Oregon to help. 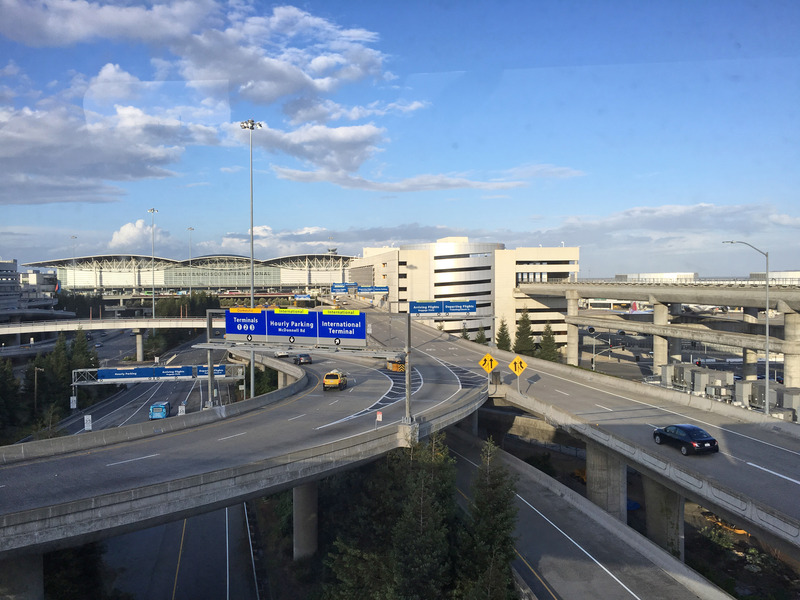 Below Katherine and I (Brian) are on the "Air Train" in SFO Airport heading towards the terminal. We start out every trip pretty much the same. A few years ago I figured out there is "international parking" at San Francisco Airport that is inexpensive and always available and does not require a car shuttle to get there. The key is: not a single international traveler has a car to park there, so it is always empty. 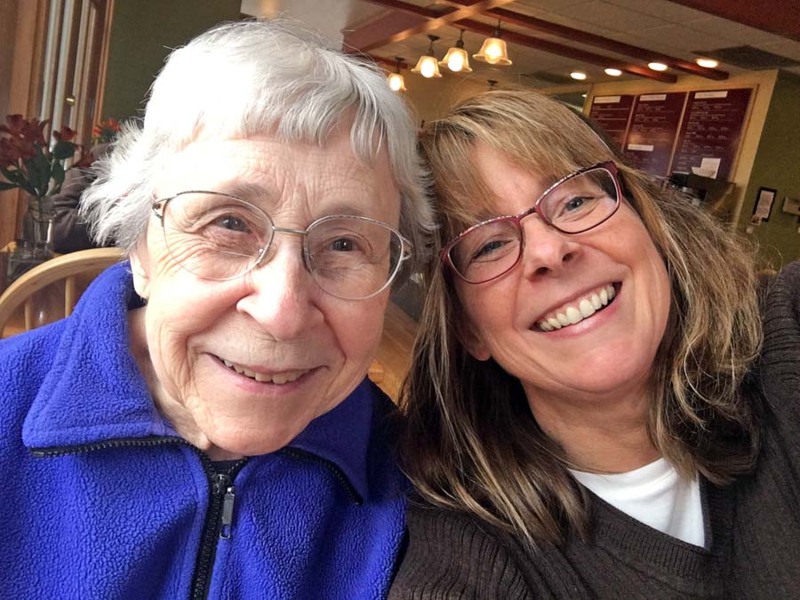 We got a couple hours sleep then got up to move Virginia (my Mom). From left to right in the picture below is Katherine (blue jacket), Howard, and Virginia in Virginia's old room at "The Caring Place". We take pictures of her old room so we can setup the new room identically. 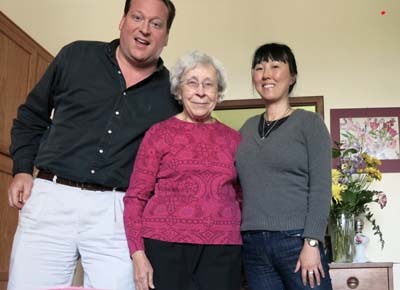 The next stage is that Brian and Howard took Virginia out around town to distract her for a few hours while Katherine ran the move. 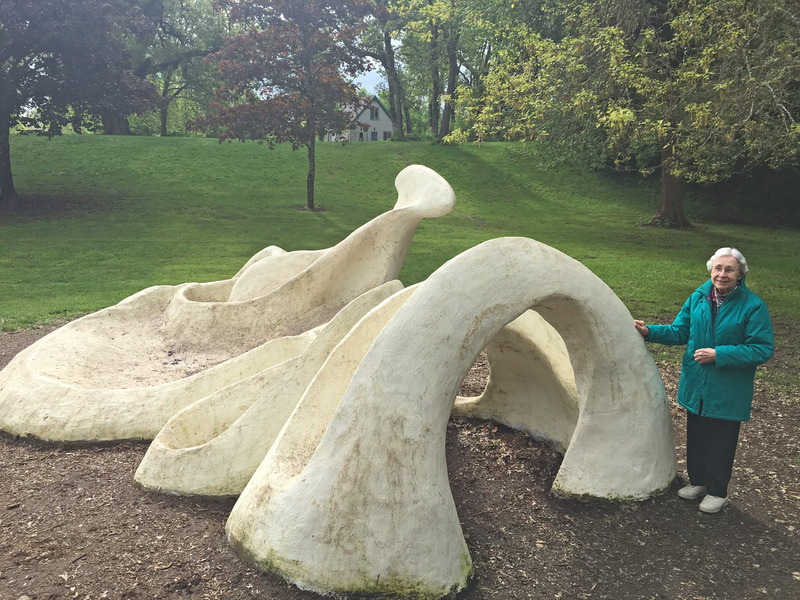 First we drove to Avery Park to look at the "Dinosaur Bones" sculpture (see picture below with Virginia). This sculpture was created by Sam Gendusa in 1969 with the help of about 30 people. Sam Gendusa was an Oregon State University instructor and was helped by students and faculty who had interests in welding and cement and art. They are made from rebar (metal) draped with a mesh of metal then covered in concrete. Unrelated to the Dinosaur bones, Sam Gendusa also wrote a book called "Carving Jack-O-Lanterns". 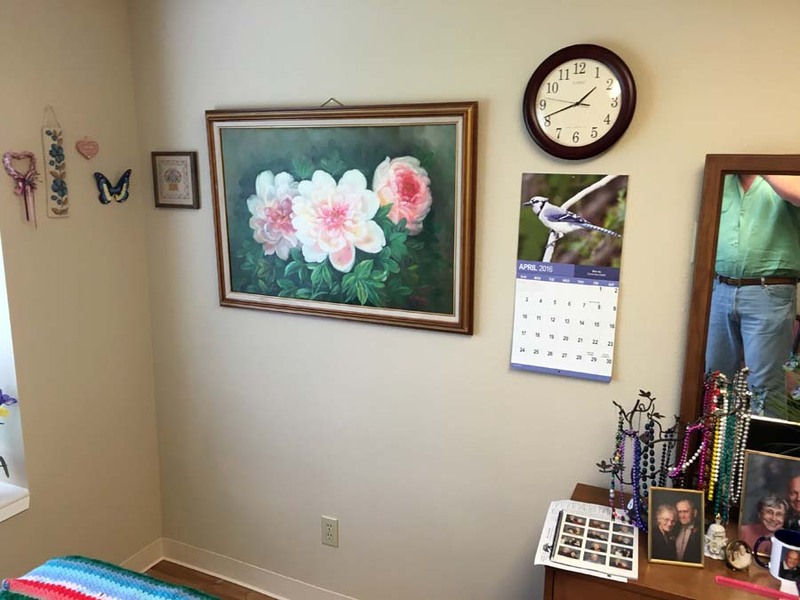 Sam also did a series of portraits called "Faces of Alzheimer’s" which I cannot find any pictures of online. IF YOU READ THIS and can find some of those portraits or pictures of them, please email me at: . "A Bunch of Dinosaur Bones - JPEG Format" - same as above but preserved in a safer format for the long term. Notice the improved graphics. The largest of the art displays looks like the vertebra of a dinosaur. As kids we would try to get all the way around without touching the ground. 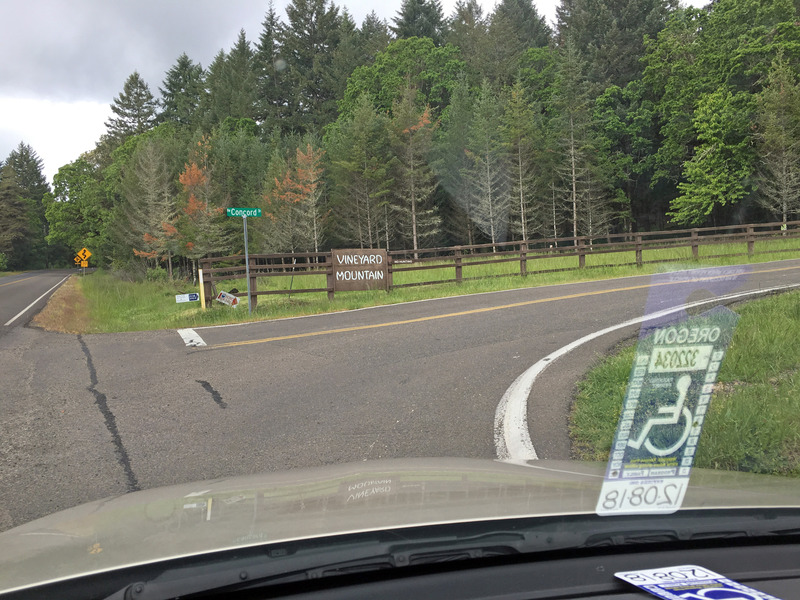 After Avery park, we took a drive out to "Vineyard Mountain" which is an area of Corvallis with some of the very nicest homes. This area was once owned by Clarence Newton as a ranch. It was sold to Arthur (Art) Stonehill who came from U.C. Berkeley, California to teach Finance and International Business at OSU (the local university). In order to afford it, Art created a corporation and brought in investors. They divided it up into 150 lots, each is 2 acres (there is a total of 330 acres in the original farm). The mountain is 1,000 feet high (topping out at an elevation of 1,500 feet). Interestingly enough, there is no "Vineyard" here and never was. I think it was named after "Elisha Vineyard" who was granted the land for free by the US Government around 1854 (give or take). 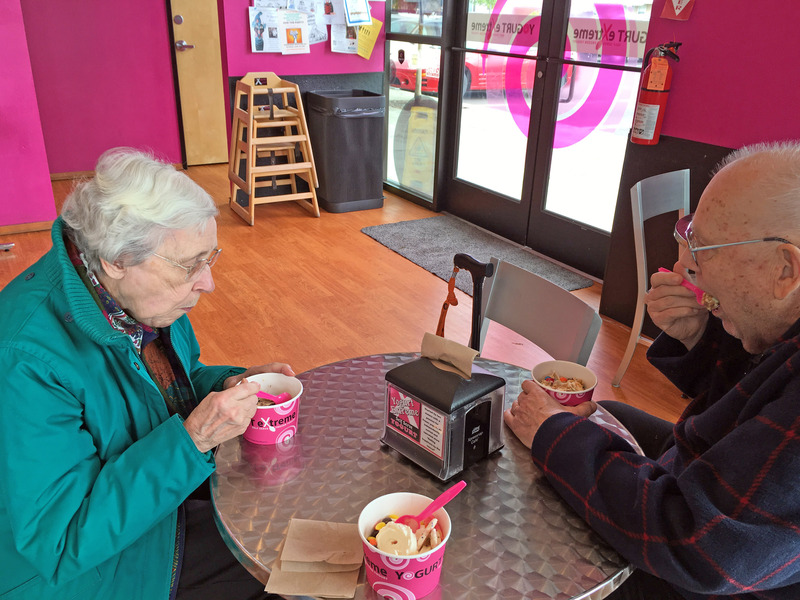 The final "distraction" was getting frozen yogurt with Virginia and Howard at "Yogurt Extreme" in Corvallis. 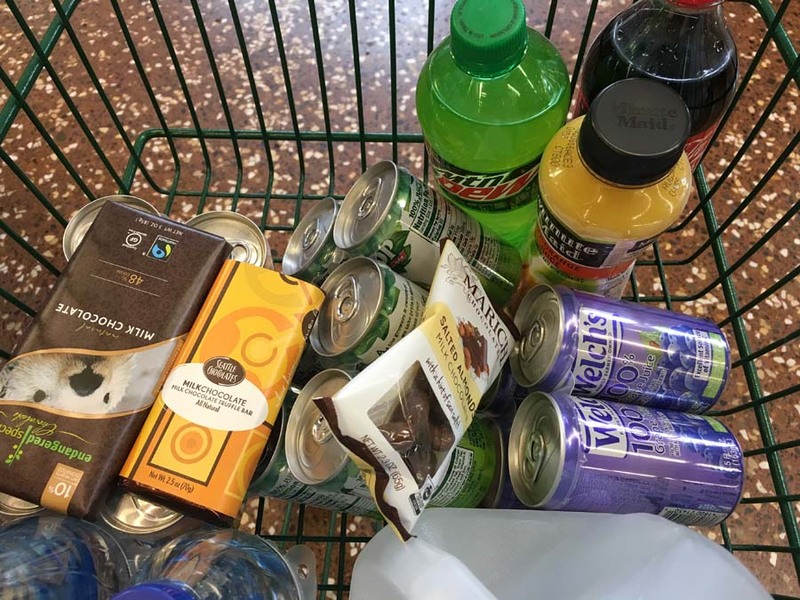 Katherine asked me to stock up on a few treats and drinks, so I ran next door to the yogurt shop and grabbed stuff. 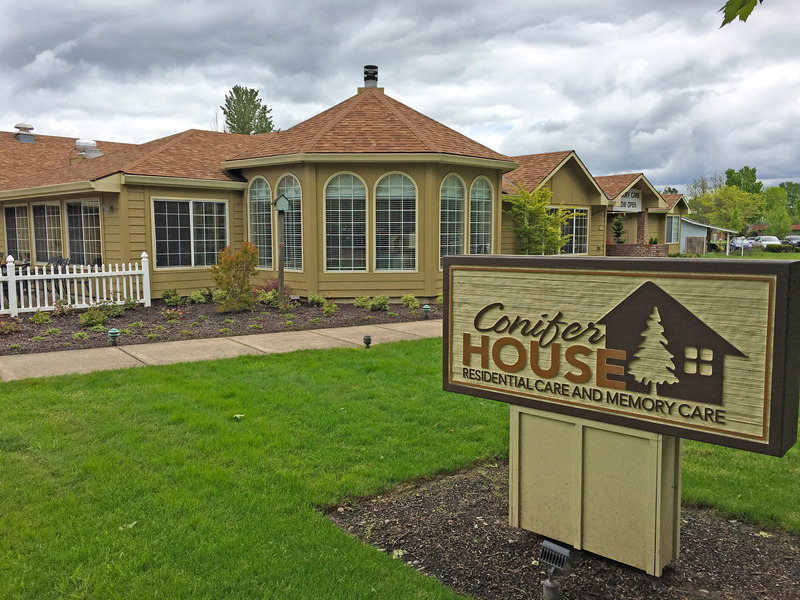 Katherine told us we were needed in the new location, and so here we arrive at "Conifer House" in Corvallis, Oregon. This is the Conifer House Facebook page. When we got to the parking lot of "Conifer House". 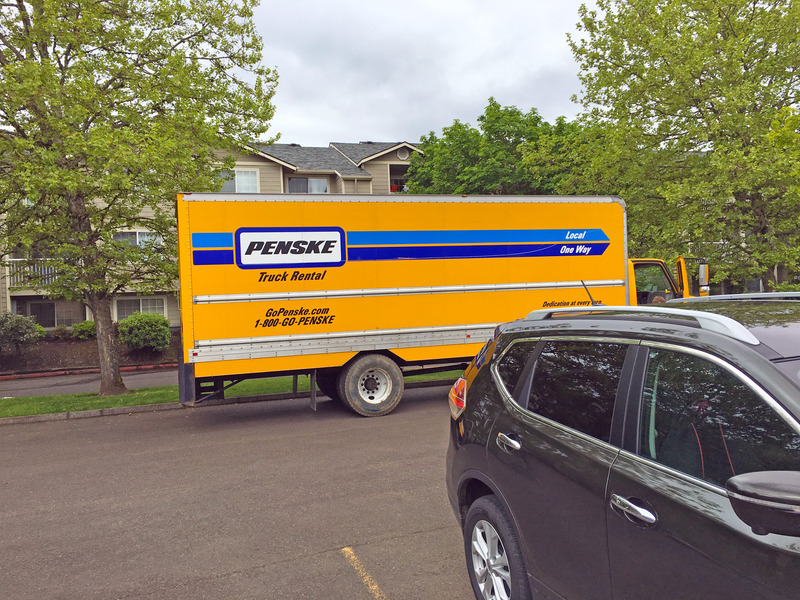 The moving van was there and almost finished. 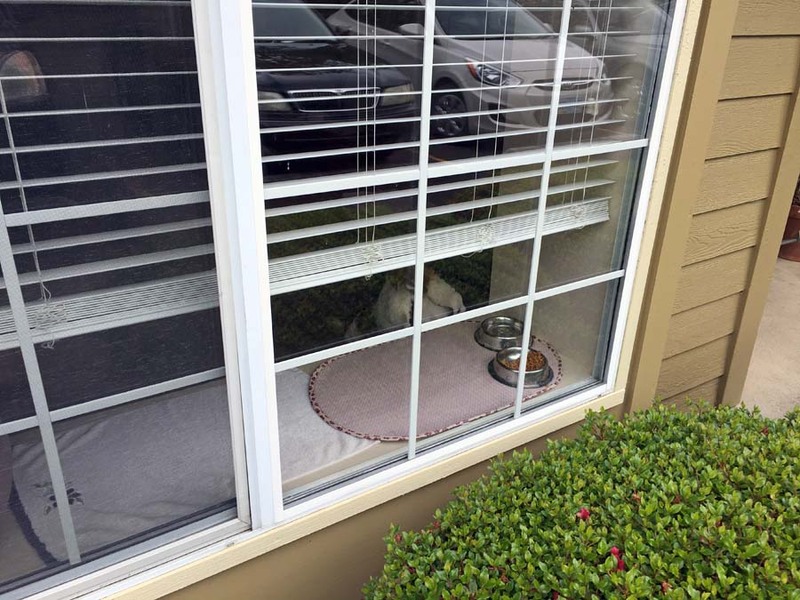 Residents of "Conifer House" are allowed to have cats. I spooked one out of this window location as I approached to take a picture. At this point it was about 12:30 so Howard and Virginia went and had lunch together (further distracting Virginia) while we furiously setup Virginia's room to match her old layout. 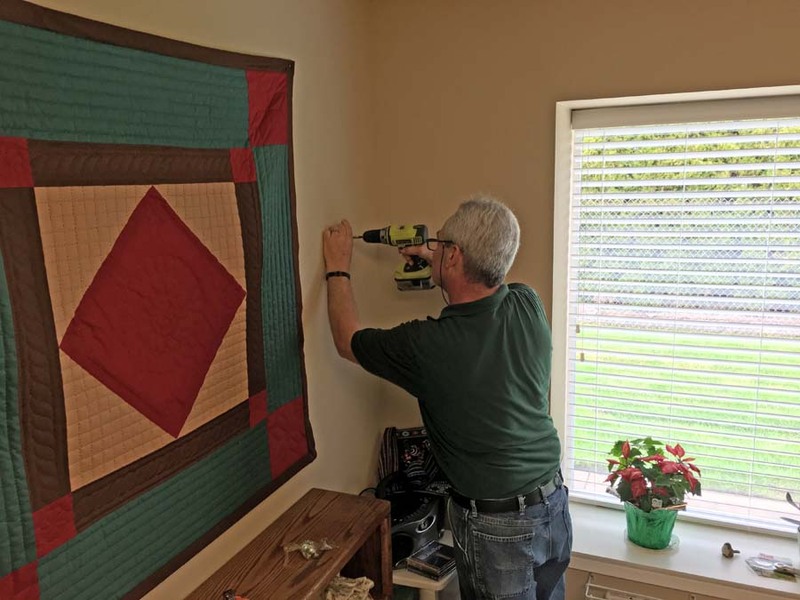 Kevin (pictured below) works for Conifer House and helped us hang all the wall hangings and assemble some furniture. The final apartment all setup is seen in the next two panoramas below. This is moments before Virginia came back and was introduced to it in it's final "finished" form. Use your horizontal scrollbar to see the whole thing. Another panorama of the newly setup apartment in Conifer house. 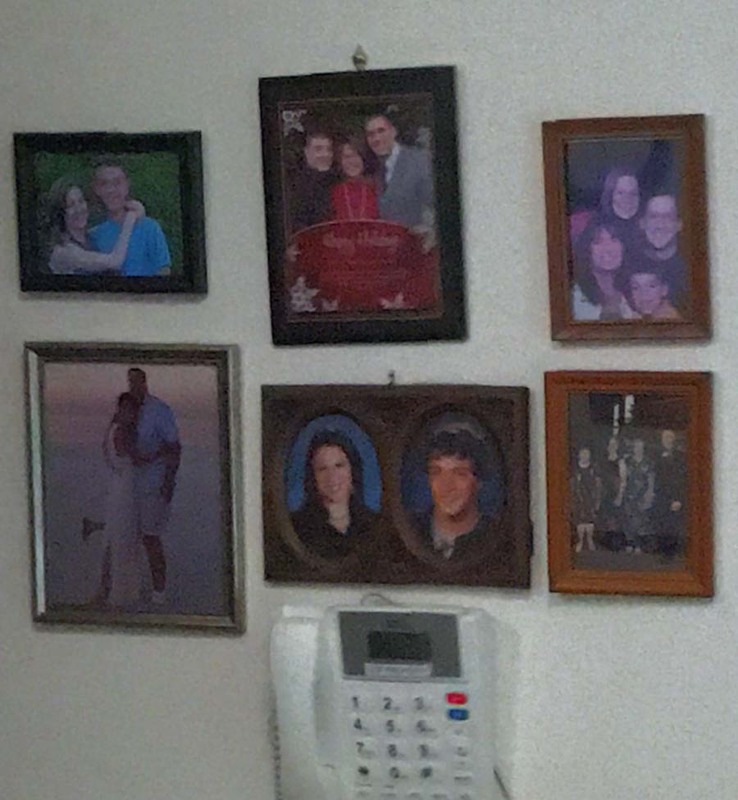 This is a blurry picture of the photos on the wall in the OLD "The Caring Place". We used this picture to arrange the photos correctly in the new location. 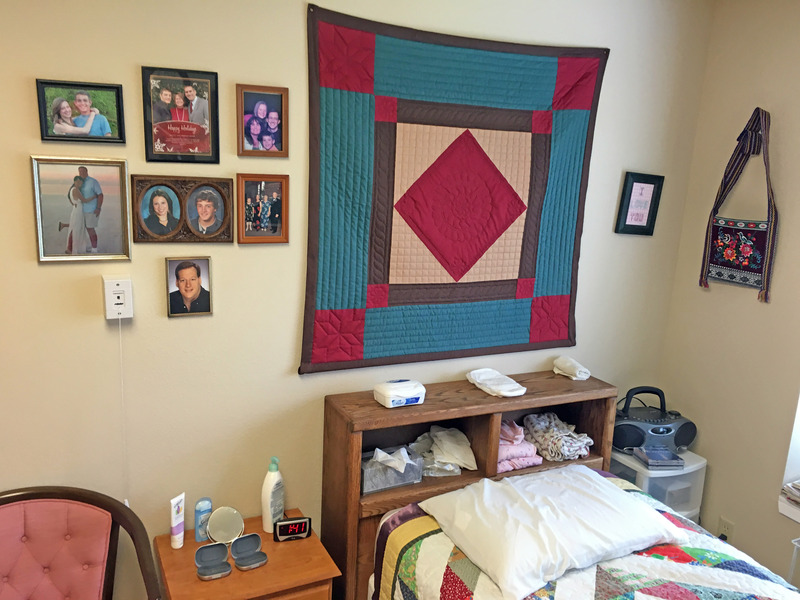 Here is a picture of Virginia's room in "Conifer House" (the new location). Notice the photo organization on the left matches. 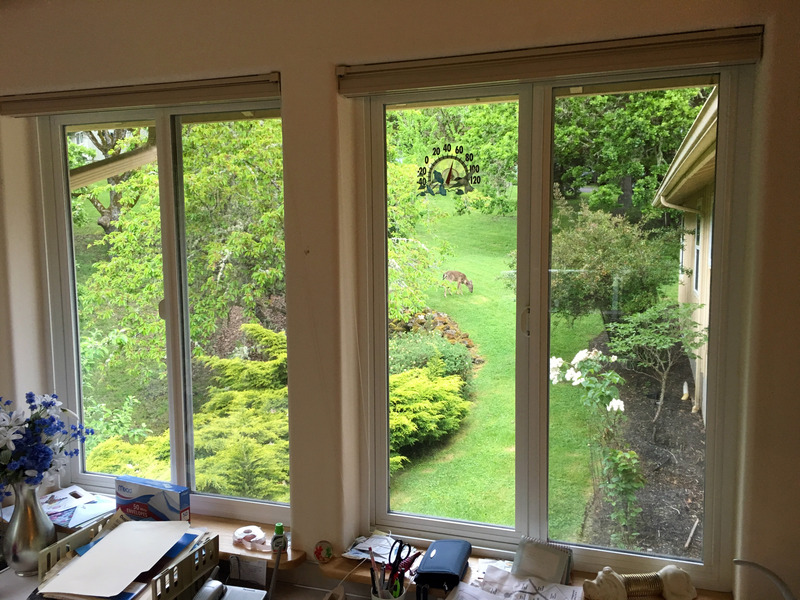 Virginia's new window view at Conifer house. We put one of Virginia's chairs in the corner below, but this picture was taken just moments before that final placement. 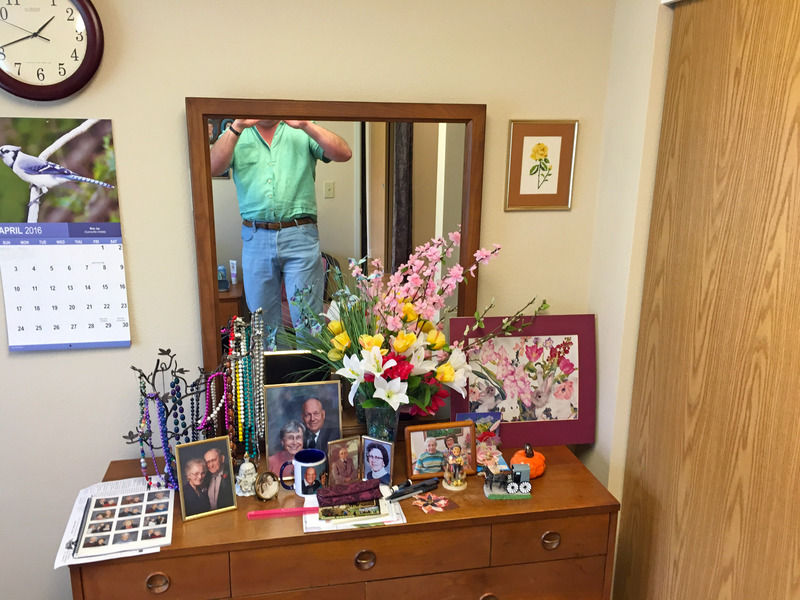 A clear picture of myself in the mirror, plus the dresser with all of Virginia's stuff. 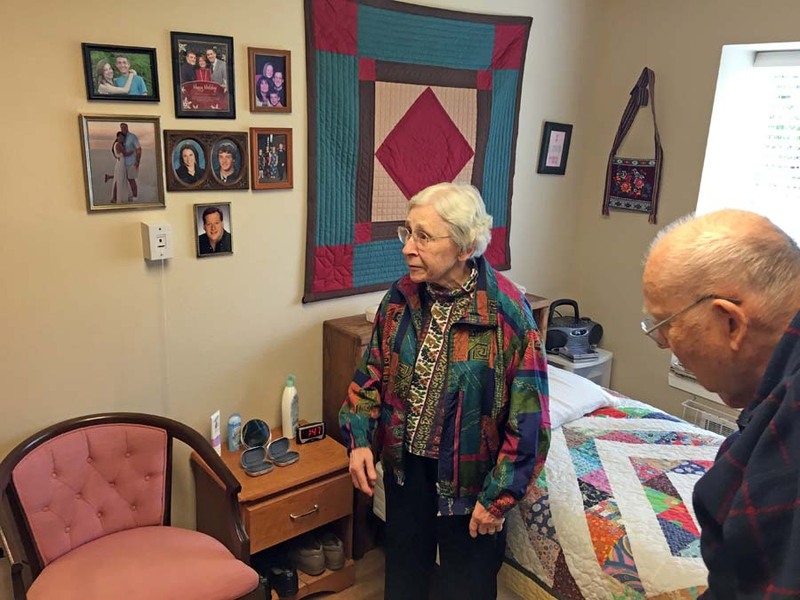 And here we are presenting the final apartment to Virginia. We walked around talking with her about the photos on the walls. Virginia (my mom) sitting on her bed in the new apartment. Virginia has Alzheimer's and is a little stressed out at moving, but surprisingly willing to give this new apartment a try. She can't remember much, and cannot process much, and is just worried about whether she can figure everything out here. We reassure her that there are people here to help her. The saddest tragedy of dementia is that we cannot "get through" to Virginia to simply relax and enjoy this permanent vacation. Virginia is worried that she doesn't know enough to do everything "correctly" here, even though there is no "correct" and they take care of everything. There are activities to entertain the memory care patients. 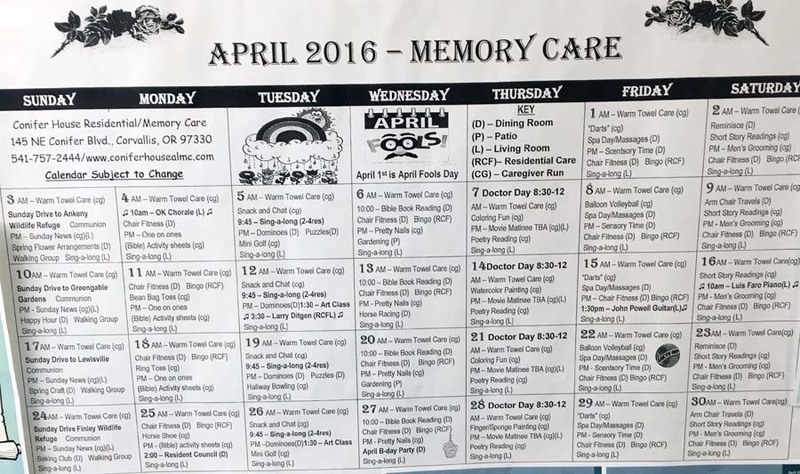 I took a quick picture of the schedule here. And below is the NEW apartment which you can see is laid out the same. Everything as identical as possible. 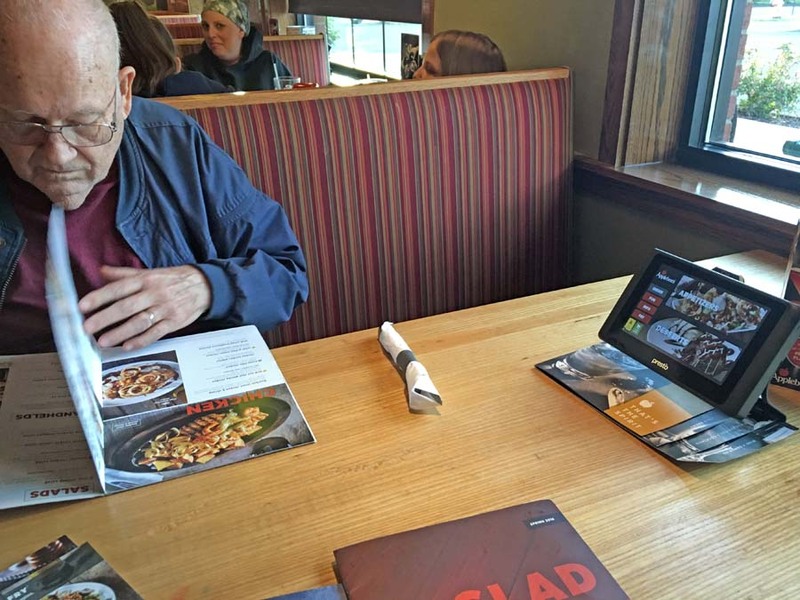 For dinner, Howard and Brian went to Applebee's restaurant. Katherine stayed home resting and napping. 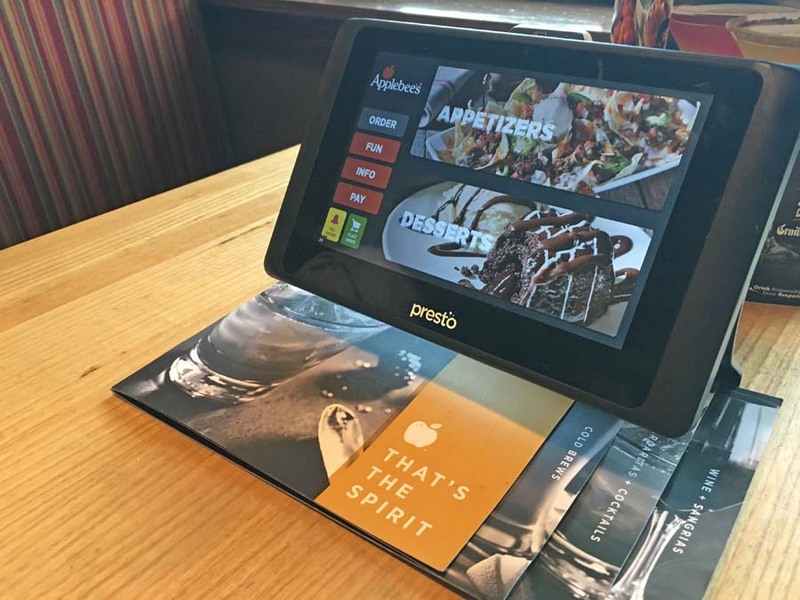 At Applebee's you can now order and pay for your meal through a small wireless kiosk on the table. This kiosk was completely self contained, it did not even have electric power going into it, you could move it anywhere on the table. You can still talk with a live waiter or waitress, but as minimum wage rises I think we'll see more and more robots instead of people doing this. If you disagree with me, stare closely at the robotic order taker and pay station below - it works TODAY! It emailed me my receipt - no more paper receipts. Now I have a philosophical question: what percentage do you tip when you gave the order by robot and paid by robot, and the only thing a human did was physically deliver the food? Now how much will you tip when the food comes on a little train track or conveyor belt? 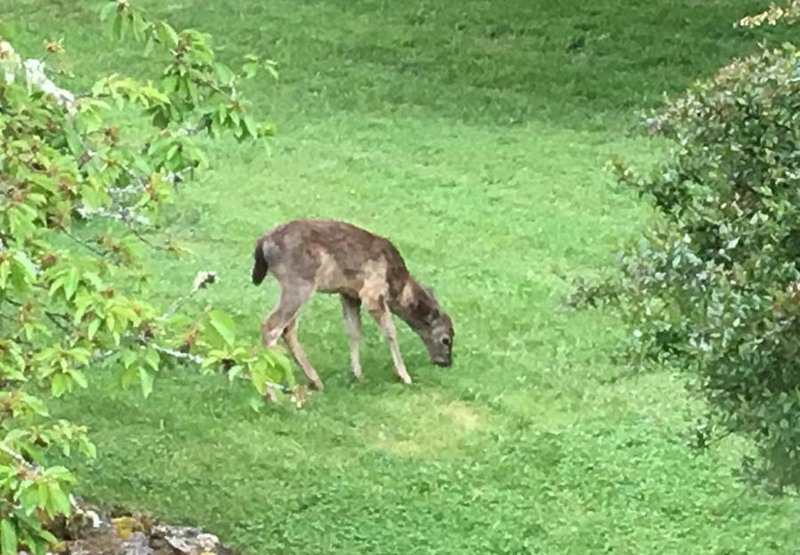 As we leave the house the next day, we saw a deer in the yard. 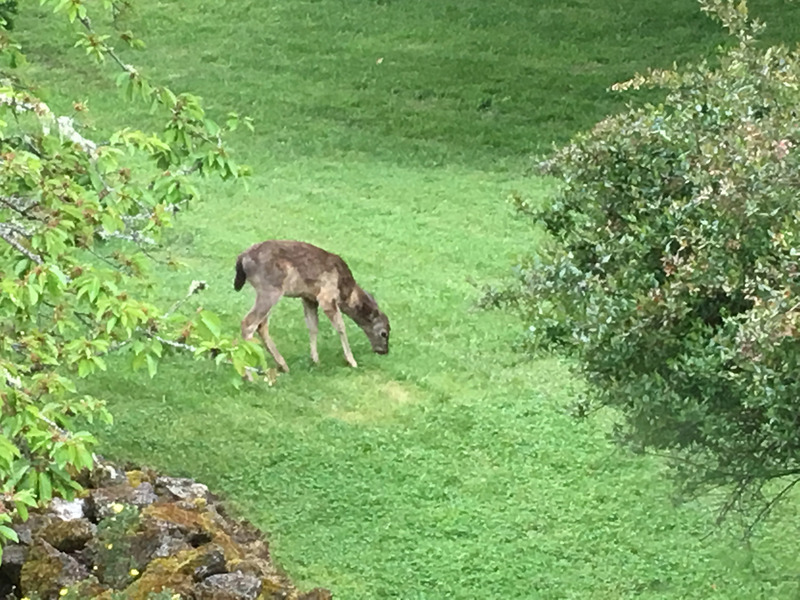 A close up of the deer in the yard. 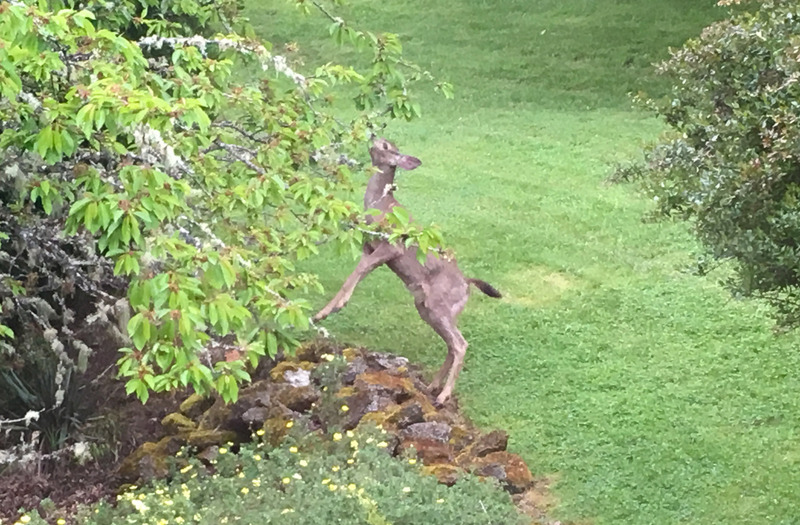 The deer would stand on hind legs to eat the leaves from the tree. If you look closely, the front legs are not touching ground. 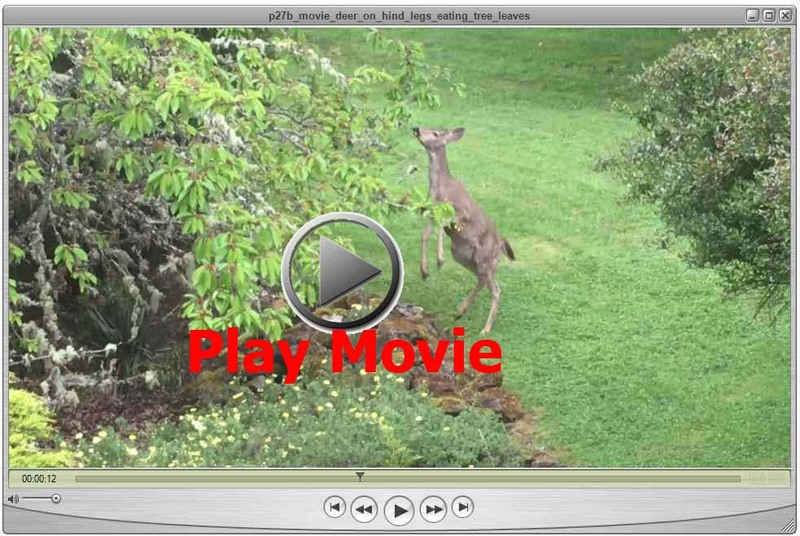 A very short 15 second movie of the deer standing on it's hind legs eating leaves off the tree. Click here for the highest quality original I have (mp4 format). 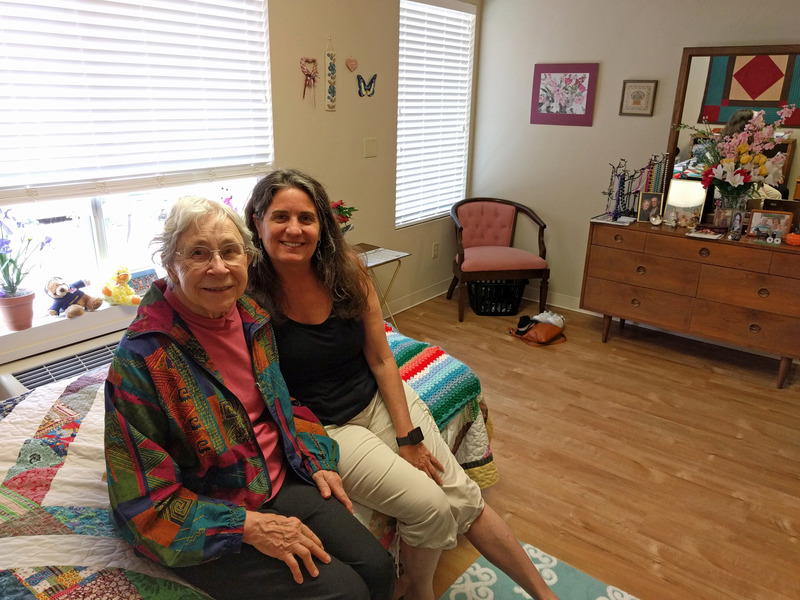 Post Mortem: three days after Katherine and I left, Randy and Ramey came to visit and helped Mom move AGAIN but just down the hallway (a private room with private bathroom opened up). 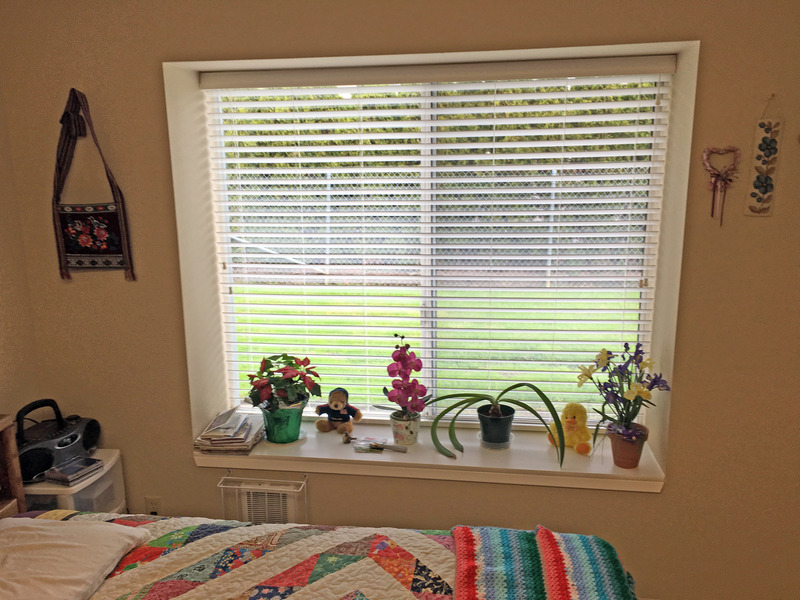 Here is a picture in Mom's newer freshest room with private bathroom. Notice we arranged the room yet again to match her old room. 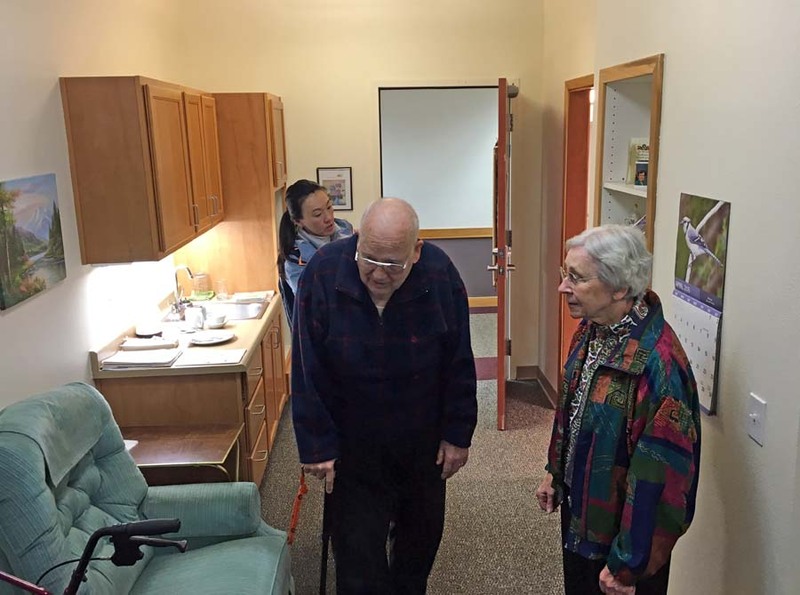 Another picture of Ramey and Virginia showing a different perspective of her freshest, newest room.